At the time of this observation, at around 5:30 am on December 3, 2013 (Hawaii Standard Time), Comet Lovejoy was 50 million miles (80 million km) distant from Earth and 80 million miles (130 million km) away from the Sun. The entire image of comet Lovejoy was made with the Subaru Telescope’s Suprime-Cam, which uses a mosaic of ten 2048 x 4096 CCDs covering a 34′ x 27′ field of view and a pixel scale of 0.2”. Comet Lovejoy is currently visible in the early morning sky as a naked-eye object in the northern hemisphere. Read more about Lovejoy’s journey through the inner solar system in this article by Bob King here. Image of comet Lovejoy on Dec. 5 by Flickr user Willo2173. 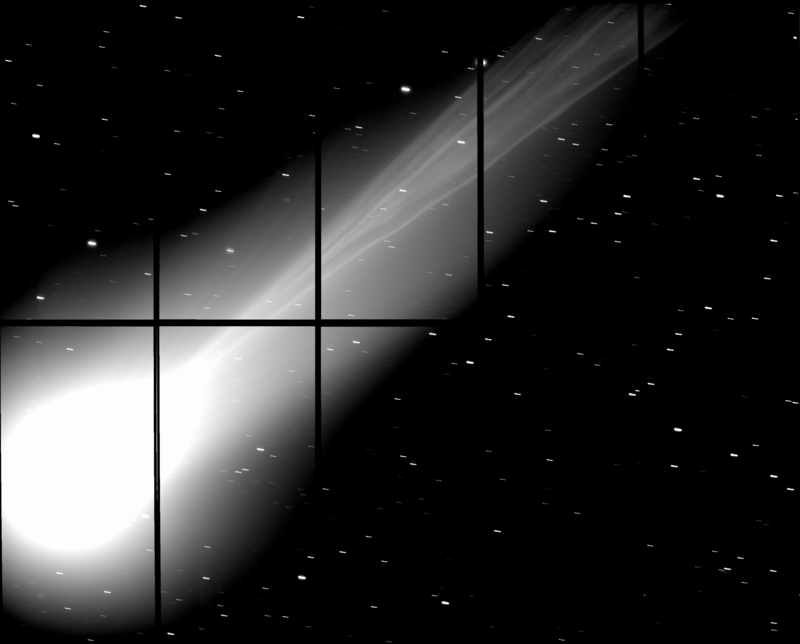 Do you have photos of comet Lovejoy or any other astronomical objects to share? Upload them to the Universe Today Flickr group!